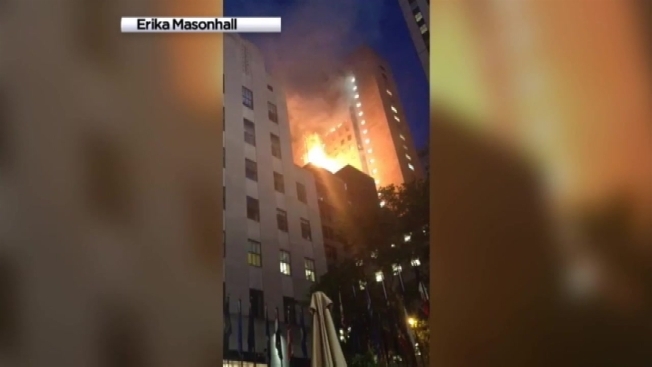 A fire at a midtown restaurant brought traffic to a halt on Fifth Avenue near Rockefeller Plaza as more than 130 firefighters responded to heavy flames and smoke coming through the roof, officials say. The blaze at TGI Friday's at 604 Fifth Ave., between 48th and 49th streets, broke out just before 9 p.m. and was under control about two hours later, according the FDNY. There appeared to be some sort of malfunction while crews were working on a duct in the basement, and a fire was sparked, quickly shooting through the duct up to the roof, where it spread to a connecting duct in the building next door. More than 100 firefighters were on the scene Friday night to battle the three-alarm blaze. One firefighter sustained a minor injury, the FDNY said. A few dozen patrons were inside the restaurant when the fire broke out. They were taken out of the building.